Whatsapp messenger is a cross-platform messaging app which allows you to communicate with your friends and family over internet without paying for sms charges. It has over 1 billion users across the globe and it still growing. Due to its popularity people also started using it for business purpose. People use to chat business things on whatsapp and later they just make print out of their chats for hard copy proof. People also take photos of clothes and send it to their customers. In this way they acknowledge their customers about new stock/fashion in the market. This is really an amazing use of whatsapp right. People also use to discuss jobs on whatsapp and lot more. But what if someday you change your phone or somehow you lost your phone. What will you do at that time ? Before anything such happens you need to take complete backup of your whatsapp chat history so you can restore whatsapp messages later. 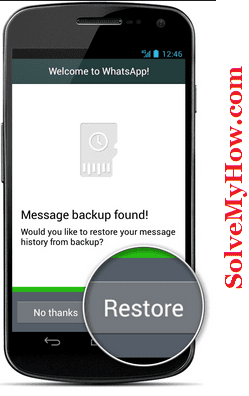 As mentioned in the above link you can learn how to take backup of your whatsapp chat. Its pretty simple and easy. After taking backup you must want to restore your backup someday right ? So in this tutorial I'm going to show you how to restore whatsapp chat easily. Well you must have backup whatsapp data in order to restore it. So this is the pre-requisite. Whatsapp can store or can take backup of your messages only for 7 days. After that it will automatically destroys it. So if you wanted restore whatsapp messages and media older than 7 days then you must have stored it either on Google drive or in your SD card. Lets see the simple step by step process of restoring whatsapp data. Either your have changed your phone. You might have lost your phone. Last but not least, you might have uninstalled whatsapp from your android phone. It doesn't matter which case suits you, restoring process would remain same. If you are deleting and reinstalling whatsapp, then you will be promoted with a option to "restore" your older data after you see the first copy of new whatsapp. Just press "restore" button and your older whatsapp data history will appear. Just make sure you import your chat history before it expires. P.S Default backup files are only valid for 7 days, last saved. Current chat history will be lost. There are only up to seven days worth of backup files. Any new message sent/received after taking the backup, cannot be restored. If you run a manual backup, it will overwrite most recent automatic backup file. So these are the few things you must keep in mind. You might be worried about your messages sent/received or deleted after taking the backup. Don't worry we also have solution of that. Read below mentioned points. 1) Create manual backup, if you do not want to lose most recent/newest messages. Go to Whatsapp >> Application Menu >> Settings >> Media Settings >> Backup conversations. 2) This is manual backup and that's why it will create a backup file in you SD card. 3) Whatsapp will name it as "messageStore-YYYY-MM-DD.1.db.crypt". You have to rename it as "messageStore-YYYY-MM-DD.1.db.crypt.current" so you won't get confused with the other backup files during the restoration process. To restore from a backup, follow these steps. Decide/select which backup file you want to restore. Rename it with the most recent data in it's name. It will popup "restore" option. Tap on "restore". Now you will be able to see your restored messages. If you want to revert the restoration, simple change the backup/database name back to what it was before. After that re-install whatsapp and then click on "restore" chats button. on whatsapp official blog. The process remains same. They will also show you the same technique to restore whatsapp backup. So this was all about how to restore whatsapp messages easily. I hope you found this tutorial helpful and worth reading. You can write your doubts or queries in the comments below. I would be glad to answer it. You can also subscribe for SolveMyHow newsletter to get instant updates about blogging, SEO and whatsapp tutorial right into your inbox. How To Hack Gmail Account ? Thanks for stopping by and commenting. Paramanand you should need to comment on hack WiFi password official post instead of this. But don't worry we have email you the password and key.